Honda Tries To Race Ahead With Its New Acura NSX Hybrid Your fantasy "supercar" may be a Porsche 918 or Lamborghini. Now Honda wants to change your dream by rolling out the Acura NSX — the most expensive car ever built in the U.S. by a major manufacturer. 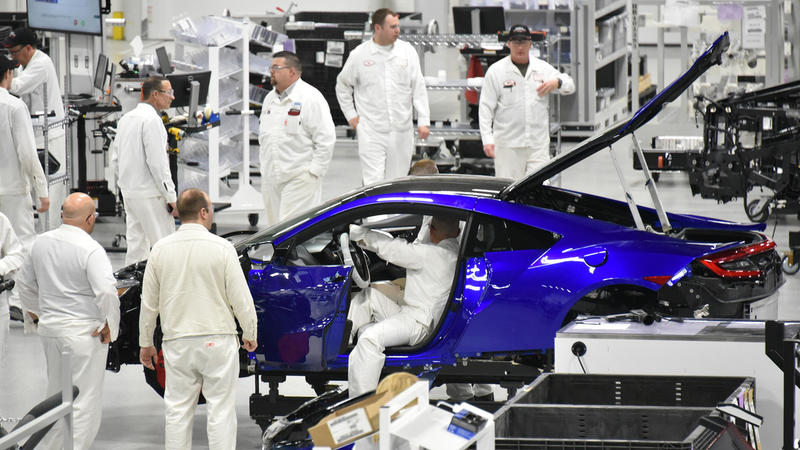 Technicians and engineers work on a 2017 Acura NSX at the Honda Motor Co. Acura Performance Manufacturing Center in Marysville, Ohio, on March 8. Porsche, Ferrari, Lamborghini, Aston Martin, Bugatti — and of course, Honda. Now, the next-generation, American-made NSX will be released in late April. With a base price of roughly $160,000, the hybrid sports car — with two seats and three electric motors and a V-6 engine — will be the most expensive car built in the United States by a major manufacturer. Honda's goal with the new NSX is to build a "halo" car — one that shines so brightly it creates a glow around all Acura models. Honda's goal with the new NSX is to build a "halo" car — one that shines so brightly it creates a glow around all Acura models. It can go from zero to 60 mph in three seconds.